After the second World War and during the Cold War there wasn’t a need for attack divers, large amounts of unexploded ordnance left over from the war had to be cleared. This was a job for a new type of diver “The Clearance Diver”. The Clearance Diving (CD) Branch was officially formed under the Admiralty Fleet Order of 1952. The equipment used by CD divers was much the same as the other diving branches. Some of the equipment is consumable and therefore needs no signature but all diving equipment, watches etc, would require signing for. The procurement department at the M.O.D. provided the CD teams with two types of divers watch: Rolex or Omega. 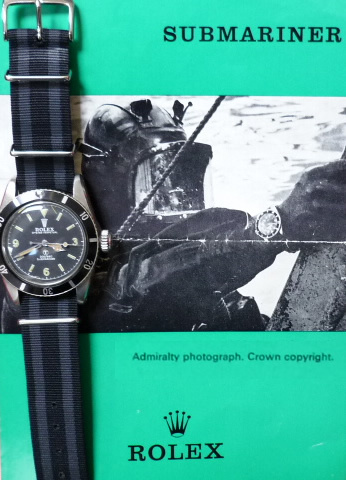 The Rolex supplied to the teams was the 200m Rolex Submariner model 6538 and variant 6538A. 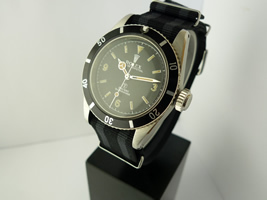 The divers watch is normally supplied only to CD teams and units. To the divers this was a valued part of their kit and was not looked upon then as anything but that. 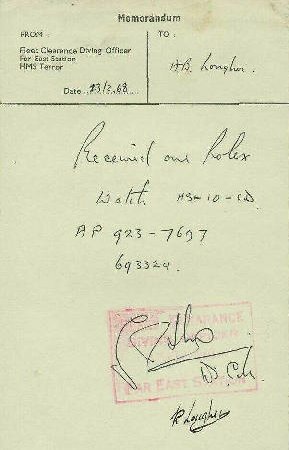 As part of my research for this watch, I was fortunate to find this fine example of a Signed receipt for a Navy issue Rolex. This receipt is a rare record and I was delighted to find it. When the Admiralty (M.O.D.) purchased Herstmonceux in 1946 the castle grounds became home to the Royal Greenwich Observatory. Within these grounds 200 people were employed at its peak of procurement, service and astronomical study. Included in the 200 employed, a division of 27 watchmakers, managers and administration staff were responsible for the following: Procurement, design, servicing and selling. This applied not only to wristwatches to ships’ clocks, chronometers, deck-watches, pocket watches, wrist-watches and divers’ watches etc. 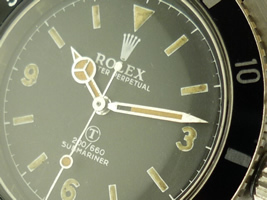 The Rolex 6538 Submariner was purchased by this department from Geneva in 1954 and according to records from Rolex, about 200 of these were imported. These watches arrived in civilian form without M.O.D. specifications. 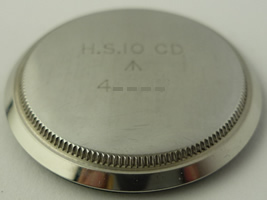 Military service watches had to meet certain guidelines; these standards were set by the Hydrographic Standard Department (H.S.). The 6538 had to be robust, waterproof to 200 metres, have a clear luminous dial, clear luminous hands, rotating bezel, fixed bars and be reliable (movement calibre 1030). The only modifications needed to the civilian 6538 were to add fixed bars and to mark the case back with M.O.D. identification. 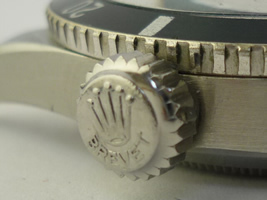 The watch shown has had its fixed bars removed so that it can be worn with an Oyster bracelet. This was not an uncommon practice when the watches were retired from use. The company with the M.O.D. contract was Watch Dials (Burford) Ltd.The 6538 as shown has a service-replaced Burford restoration dial. These are now known as Burford dials. As you can see the printing is not as sharp or accurate as an original, especially the coronet. Also the style of lettering on the dial is much more refined and precise on the Swiss dial as illustrated. Note, the “T” and the 200m– 660ft as an example. This article was researched and published by Superlative Time. great article! . Posted a link to it at watchlords forum. I really enjoy reading this blog.